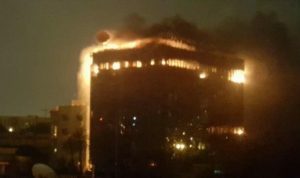 The head office of the Aman Bank in west Tripoli’s Gurji district was ablaze this evening after being attacked by angry locals after a member of the militia guarding the bank shot a customer dead this morning. The guard reportedly shot the man, named as Usma al Al-Alam, when a large crowd of customers queuing the bank to withdraw cash tried to force their way in. In the ensuing chaos, the guard is said to have shot directly at customers. Angry residents from Gurji, where Al-Alam lived, then attacked the bank, shooting at it and setting fire to equipment, and blocking off roads in the area. During the day, the violence intensified and the building was hit with RPGs, setting it ablaze. The damage to the building is thought to be total although the bank management earlier sought to reassure customers that their money and personal data were safe, being held elsewhere. The situation was aggravated by the fact that the militia guarding the bank are from Misrata while the dead man was originally from Zintan. Aman Bank has been widely regarded as the most customer-focused and the most efficient and up-to-date in Libya. There have been a number of similar incidents in recent months. Five weeks ago, two customers were shot dead by guards during chaotic scenes outside the Tajoura branch of the National Commercial Bank. Last May, five Bank of North Africa customers in Gasr Ben Gashir were killed when a guard opened fire, again in a case of attempted crowd control that went disasterously wrong. In neither case have the attackers been arrested or tried.